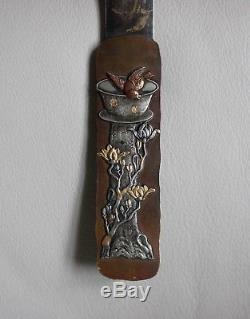 For sale is this lovely antique Japanese mixed metal letter opener. The handle features a silver owl perched in the hollow of a tree with surrounding birds and foliage. The reverse has a charming scene of a bird bathing in a bowl of water perched on top of a tree trunk with magnolia or peony blossoms beneath. A mix of bronze, silver and gold have been used to great effect in this delightful piece. 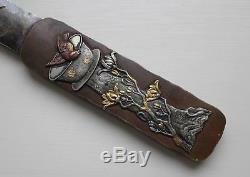 The blade has engraved decoration to both sides, a deer looking up at the moon to one side and an owl in a tree to the other. Condition is very good with some wear to the white metal blade which looks to have been gilded originally. A very nice quality item ready for use or display. Measures 29.6cm long by 2.5cm wide and 0.8cm thick. 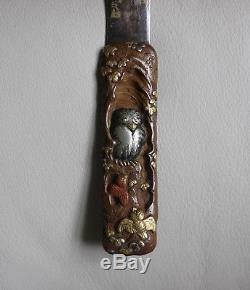 The item "Antique Meiji Japanese Mixed Metal Shakudo Letter Opener Owl and Birds" is in sale since Sunday, June 3, 2018. 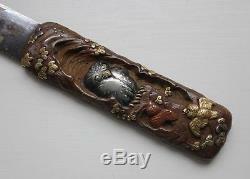 This item is in the category "Antiques\Asian/Oriental Antiques\Japanese\Other Japanese". The seller is "hoko_road" and is located in Tarporley.